Recently, I participated in a free Webinar with TapInfluence (a great sponsor of Convince & Convert) called The 8 Things Influencers Can Do For You. I wrote a post about the webinar, and included a recording and the slides here. Today, I want to focus on one specific part of that session: how to pitch influencers. Social media and PR bloggers have been talking about this topic for years, yet I don’t see pitches getting much better. So, I’m going to take ONE MORE crack at this, today. When you are sending an email to an “influencer”, it really doesn’t matter what you’re asking them to do (write about your product, attend your event, share your post in social media) the same components of your pitch need to be present. Remember, you are asking someone to tap into their time to engage in an activity that they weren’t likely to be engaging in otherwise. Make sure it is CRYSTAL clear what’s in it for them. If influencers can’t understand within three paragraphs how this will benefit them in terms of traffic, influence, or cash, you need to rewrite the pitch. 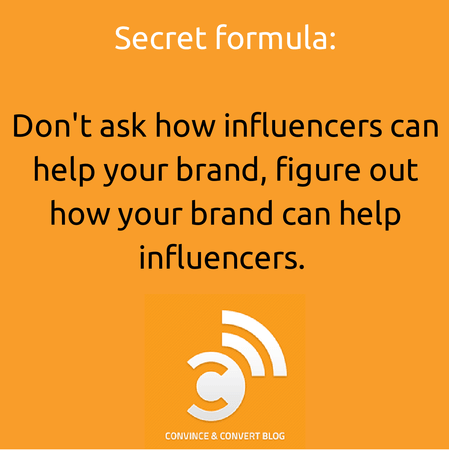 Don’t ask how influencers can help your brand, ask how your brand can help influencers. Far too many of the pitches I receive provide a broad outline of what’s possible or what’s expected, but then leave it to me to decide how I want to participate. I think the assumption is that people crafting pitches don’t want to be too specific, because it will seem like they are dictating the terms of engagement, and influencers may not like that. This is mistaken thinking. When you put it in the influencers’ court to think through the next steps and potential interactions, it doesn’t liberate them, it creates more work for them. A sense of urgency matters. Provide influencers with a specific timeframe for participation, and don’t be afraid to provide a small window for making a decision. Remember that based on the benefits outlined per #1 above, most influencers will have a strong sense of whether they want to participate by the time they finish reading your email. You don’t need to (and shouldn’t) give them a week or two to mull it over because it’s likely they’ll forget all about it during that period. And NEVER send an influencer pitch with an open-ended deadline. That’s like lighting money on fire. First of…the ladies at Swell wanted to send some love for your style blog…we may or may not use it for inspiration sometimes! Swell is a beach lifestyle boutique from Southern California. Although we do carry the larger surf brands, we like to keep the focus on more up-and-coming contemporary brands. We think our fans would really resonate with your style (especially now that you’ve become part of the Volcom community), and would love to work with you on a curated collection, sweepstakes, or maybe just sending over some product from the site. Swell has a large following, so it could be a great opportunity to gain some exposure on both sites. Anyway, let me know what you think, or if you have any ideas/questions/etc. Or if you’d rather, we’d love to send you some apparel from the site – just let us know what resonates with your style. Hi Natalie. I absolutely love your blog, especially the . I’ve got a limited opportunity for style bloggers that I’d like to run past you please. I’m Nicole, the Community Manager for Swell.com, an online beach lifestyle boutique. We’ve been around for 10 years, and have an email list of more than one million customers. We carry the big brands like Billabong of course, but also up-and-coming brands, too. Our team at Swell has selected our 9 favorite style bloggers, and of course you made the list. We’d like to send you 3 outfits from our Fall collection. Then after you’ve had a chance to check them out, we’d like to interview you on Skype about which one you like best and why, and then include that video on our Facebook page, where we have 61,000+ fans. It’s a great way to introduce a bunch of new people to . We’d like to get the clothes out to you tomorrow, and schedule the video interview on . Can I get your mailing address today please? Also, please let me know if you don’t want to be a part of this program. Thanks! I look forward to working with you. The revised influencer pitch has specifics, fluffs the influencer’s ego, makes the benefits clear, and provides a concrete deadline and call-to-action (plus, a reverse psychology opt-out). Now you try! Send me your best pitches at jay@convinceandconvert.com If I like yours, I’ll write another post showcasing your approach.